Hey friends! 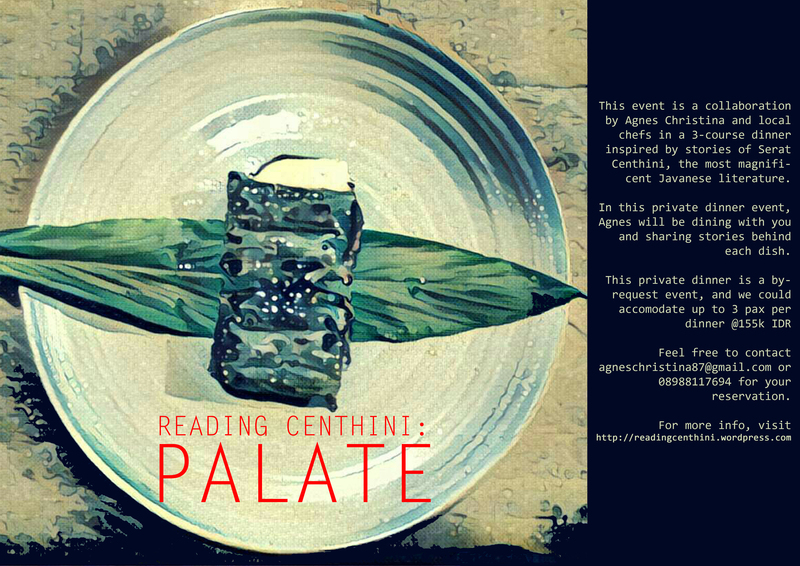 I’ve officially launched this newest edition of Reading Centhini series titled PALATE. For now, this dinner event is only available in Jogjakarta as a private, 3-course dinner. Max 3pax per session, @155k IDR. You’ll need to reserve at least one day prior to the dinner to agneschristina87@gmail.com. Then I’ll send you the gps location for the dinner and I’ll see you there! In this long term collaboration with local chefs Lanang Sulistyo and Dea Jemima, you’ll be dining with me while I tell you stories behind each dish and many more things about Serat Centhini and Javanese philosophy of food. Oh, and we always develop our menu, so you can join us for a million time and the food would never be the same!